The Point Reyes 200k weather forecast called for some rain for the day, just a 30% chance, but I had prepared the un-fendered Habanero MTB and decided to take my chances, after all I had a new untested secret weapon against light rain, on paper it should work fine. I had missed the boat during the holidays to order a pair of Rainlegs when they were dirt cheap online. During the very rainy week before this brevet, cabin fever got into me in a good way. Scissors in hand I decided to make knickers out of a damaged pair of rain pants I had until recently been using for commute. Chopped them just above the legs zippers and got a new fashion thing going, yep, instant Ghetto Prêt-à-Porter Rain-Knicks. All I needed now was some 200k rain to test them out. Proudly wearing my new fashion creation I rode the short 5 miles, in light rain, to the Golden Gate Bridge where plenty of riders had gathered for the privilege of enduring the leg killing rollers of this 200k brevet. A few familiar faces and many new ones. Visited with friends, Jim E. and then with Greg B. just for a few moments and then at 7:00 we were moving. I started with the faster riders, however from past experience I know I can't keep that pace and not be trashed after 125 miles but I could ride with them at least till we left the urban area right after Fairfax. So I did just that, I slowed down a little at the bottom of White's Hill, right after Fairfax and let the lead group go. On the other side of that hill I rode a conservative pace until a trio of riders caught up with me and I jumped at the back of their paceline. They quickly connected with the lead group and right before the SPT park I knew it was prudent for me to slow down, my objective, as usual, was to have a good ride first and if possible improve my time over previous years. Took the Samuel P Taylor park bike trail which was very clean of debris but very wet. Here I paid for not using the fendered bike today. My ghetto knickers worked remarkably well at keeping my legs dry from both the rain and perspiration. The wide openings just below the knee allow air in and help regulate my temperature nicely, however the lack of fenders meant all road spray was hitting the back of the knickers and the water that rolled down the legs found its way inside the neoprene booties and eventually a little went into my socks. Had I used fenders I would have probably stayed completely dry. This was the wettest part of the ride for me. The rest of the day it rained on and off but never too bad. Once at top of the Olema hill on Sir Francis Drake the rainbow was announcing that a weird weather day was ahead, got my camera out and pointed at it and pressed the shutter twice, I did I swear. No photos to prove I saw the rainbow gold pot though. At the foot of the hill right after Inverness my chain got stuck badly between the middle and small chainrings, that is part of the compromise of riding such a mix of components. First generation XTR crank arms with unramped Sugino chainrings, shifted with thumbshifters in friction mode and a 9 speed cassette/chain. I love that combination but every once on a while I get small trouble like this, still a very reliable drivetrain. Anyhow, after taking the gloves off, flipping the bike upside down, getting oil all over my hands and a few minutes of frustration I was able to pull the chain out and continue the ride. Many riders passed me here, most asked if I got everything I needed. Sure I did. I had been eating a little bit more than usual on purpose as on recent rides I had noticed I was getting tired after just 40 miles. I think that has to do with the diet my wife, and by default me, am eating that does not provide enough carbohydrates. I eat enough crap while at work but dinner at home is that weird diet, I like the dishes but I definitely have to complement with more food while on longer rides. I had different bands of energy bars, energy gels, crackers and some fruit. This time I was the first brevet i was using electrolyte flavored tablets that dissolve in water. I started with my regular Gatorade but at the first control I topped the water with the tablets. They are easier to carry than the powder Gatorade and also pack lighter/smaller. I think they work almost as well as the Gatorade for me but this will need more testing. Getting ahead of myself again. A few miles before the Point Reyes lighthouse I caught up with Greg. We ride together on weekends and sometimes during the week, he's usually faster than me on brevets but today he brought his heavier fendered bike and he was simply not having a good day. I arrived at the lighthouse a little before Greg and left right after he had left, we connected again but just for a little while. We both were riding at our own pace and at this point they were different. Nice riding to Point Reyes Station from the lighthouse. I knew I was not going to stop for long at the Marshall store, our second control, so stopped at the public restroom on one of the back streets of Point Reyes Station. It was nice to sit, even if it was on a toilet. Pointed the hand dryer to my shorts and warmed the front part. Once out filled up the backpack bladder with water and ate stuff I had picked up at the Point Reyes Lighthouse control. While refilling with water I saw Greg ride by, no hurries I would try to catch up with him later. More nice riding to Marshall. I purchased some water and a juice and was ready to go within very few minutes from this second Control. I was starting to get tired and Greg was still there but almost ready to go so I decided to wait for him and have company. 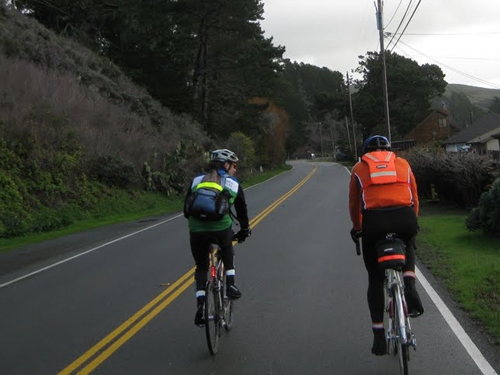 We rode together to near Nicasio where I stopped to pickup an orphan "randonneursUSA" reflective ankle band a faster rider had lost and then once more for a quick restroom stop. It was a few minutes past 2pm. I knew I could make it to the final control in about two hours so I decided to try to beat the 9:00 hour mark for this event. At San Geronimo Valley the route retraces its path back to the start; right before climbing White's Hill, I was feeling tired but once I hit the descent things changed, I found energy and pedaled at a brisk pace till Larkspur where I faded. The Camino Alto hill was right there in front and I had no backup battery to fuel my body but somehow made it to the top and down where I started looking in my small bento-box bag for food. Crackers and a gel shot would do while moving towards Sausalito, then used a trick I recourse to when tired and I convinced my legs and body I had just started the ride, it worked as usual, climbed that last hill to the Golden Gate Bridge without suffering much. The afternoon view was great from the bridge deck, I had time to enjoy the view. Not many riders on the bridge and no randonneurs in front that I could see. Arrived at the final control a few minutes before 4pm, 8:57 hours after we had started this morning. My fastest time for this route so far. I was a little tired but happy to see other riders there hanging at the final control. Greg arrived not too long after 4pm and we chatted there for a while. When the sun stopped shining directly on us the temperature dropped fast, It was time to go home or face the shivering, opted for going home. Jumped on my bike and rode the easy 5 miles to a warm shower and a recently ordered calzone. Nice 200k again, this does not get old.